Profile: His origin has been told in several different ways. In the G1 cartoon series, (toward the end of season 2, "War Dawn") he was a young power-plant worker named "Orion Packs" who went on to become the great Optimus Prime. A slightly contradictory story was told of Prime's origin years later (2003) by Simon Furman, in the Dreamwave comic series, "The War Within". Another more detailed rendition was told in the novel by Alex Irvin, Transformers: Exodus. However he came to be, there is little disputing, that Optimus Prime is the greatest leader the Autobots have ever known. The following text is from the Marvel Comic series, "Transformers Universe." If he had been on Earth he would be a doctor, a mechanic, a scientist & a warrior. But on Cybertron there is no difference between these professions. So Optimus uses his skills to heal and repair which are the same things to Autobots -to improve the world around him and, if necessary, to fight. Both in power and intelligence, he has no equal. He has the personality of an Abraham Lincoln. He can be immensely kind and his compassion extends to all that lives, including the creatures of Earth. Yet he will battle unceasingly to protect the weak and defend what he believes in. To accomplish this Optimus knows that the Decepticons must be defeated for all time. This text description of OP's character "Bio" comes from the Dreamwave series, "TF: More Than Meets the Eye" #4 (which I highly recommend purchasing, if you haven't already! )From the personal datatracks of Ironhide, Autobot Security: I'd lay down my life fer Optimus Prime, no question. Sure, I got plenty of buddies in the Autobot army that I'd do anything for, but no one more so than Optimus. With Prime, you never gotta worry if he's thinking somethin' about you that he ain't sayin'. He's as honest and well, kind as they come. But more than that, he's a loyal friend whose absolutely dedicated to what he believes in. An that's what counts. You know Optimus ain't gonna leave you behind, and when he's on the job you can just feel in your circuits that he'll handle things no matter how grim it looks because you know he can. He's got all the capabilities you'd want in a military commander: he's fearless, intelligent, compassionate, and powerful. But what I respect most about him is that he wasn't always that way. I've seen him change and grow from a timid unsure archivist who just happened to be put in charge, to a wise and confident leader. I think that's why every Autobot'll gladly follow Primes's lead without him even having to ask. He understands what it's like to be in their shoes -confused, scared oilless and just trying to do what's right -so he'd never ask something of them that he wouldn't willingly do himself. Abilities: In robot mode, Optimus Prime actually splits into three components. The Optimus module is the robotic sentient being that is the storehouse of his vast knowledge and strength. He can lift 4,000,000 lbs. and blow from his fist exerts a force of 12,000 lbs. per square inch. He carries a laser rifle and can burn a hole in the nosecone of a Decepticon jet fighter at a distance of 30 miles, aided by his outstanding visual acuity. His Prime module also known as Roller, is a smart cart shaped device that he uses to unobtrusively slip behind enemy lines. He can maintain radio control over it at distances up to 1200 miles. Having Roller present somewhere is like being there himself. He can operate by remote control his Combat Deck module up to a distance of 1500 feet. 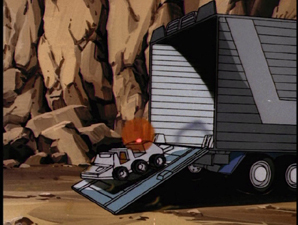 The Auto Launcher mounted on the deck can use a variety of artillery and radiation beam weapons, including most of those used by his fellow Autobots. The launcher also includes a highly dexterous grapple arm which allows it to load itself and change its weaponry. The communications disk antenna mounted on the launcher provides a link between Optimus and all his fellow Autobots within a radius of 50 miles. It can be adapted to a satellite hook up that increases its effective range 10-fold. Weaknesses: Although Optimus Prime can function as three independent modules, injury to any one of the modules is felt by the other two. Roller is particularly vulnerable, especially in the behind the lines situations in which he specializes. However, the Optimus module is by far the most important component of the trio. Although he could survive without the other two, they could not survive without him. Otherwise, the only weakness he could be accused of having is being too compassionate and concerned about the safety of others. He would be a more effective military commander if he were more ruthless but then he wouldn't be Optimus Prime! 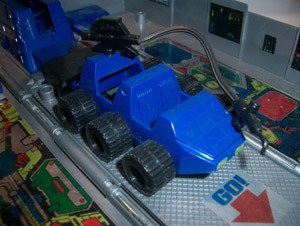 Shown above see "Roller" toy component to the left and cartoon depiction to the right. Most of the toys sold in 1984 and later included Roller in blue, but there is also a more rare grey version, seen in the 'what's included w/ this toy' picture from the directions and that is apparently what the animators worked with when illustrating this sceen from More than Meets the Eye, part 2.